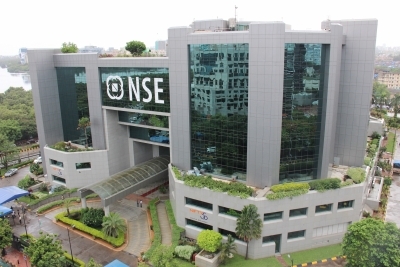 Mumbai July 13 (IANS) The BSE Sensex hit a fresh record high of 36 740 points in the morning session on Friday but eventually trimmed major gains to trade marginally higher during the afternoon session. It had touched an all-time high of 36 699.53 points on Thursday. Following firm Asian cues and healthy quarterly earnings announced so far the Nifty50 on the National Stock Exchange (NSE) also traded over the 11 000-mark with marginal gains from its previous close. According to market observers heavy selling pressure on the banking and auto indices trimmed the gains on the domestic indices. At 12.21 p.m. the broader Nifty50 of the National Stock Exchange (NSE) traded at 11 033.30 points -- higher by 10.10 points or 0.09 per cent -- from its previous close of 11 023.20 points. The barometer 30-scrip Sensex on the BSE which had opened at 36 635.14 points traded at 36 626.22 points (12.21 p.m.) -- up by 77.81 points or 0.21 per cent -- from its previous close of 36 548.412 points. As mentioned Sensex has touched a record intra-day high of 36 740.07 points so far and a low of 36 528.05 points. The BSE market breadth however was bearish with 1 612 declines and 693 advances. The top gainers so far on the Sensex were Infosys Adani Ports Reliance Industries Wipro and Coal India whereas Axis Bank ONGC State Bank of India (SBI) ITC and ICICI Bank were the top losers. On the NSE Coal India Reliance Industries and Infosys were the highest gainers while UPL Bharti Infratel and Axis Bank lost the most.